So that was my Seventeen cover way back in January 2006! I was 15 turning 16 years old then, so no surprise if I look different from now! Haha the eyebags are a constant though. The article isn't very interesting. I remember mentioning Neopets as one of my pastimes so the poor intern had to devote one entire paragraph to roughly outlining what Neopets is hahahaha. I actually found this particular issue one day when I was at Serangoon's Salvation Army shop sometime in JC (it's down the road from SAJC) and decided to buy it haha. Random but those jeans are mine haha. Think the ones the stylist had brought didn't fit or didn't suit or whatever. And while I was scanning stuff I decided to scan this as well. This was for a L'Oreal hair editorial or something, back in 2007 (when I was 17 and in JC1). This was in a little L'Oreal booklet that came with Cleo. Don't remember which issue but it should have been around October/November. Oh and by the way I was having a STY when I did this photoshoot. For those who don't know, a sty is kind of like the inflammation of an eyelash root or something. It causes a build up of pus and makes your eyelid swell. I remember being up in the morning squeezing out the pus. It hurt so bad I swear, but it did help lower the swelling. If you look at the outer corner of my left eye you can see how it kind of slants/slopes a bit differently. 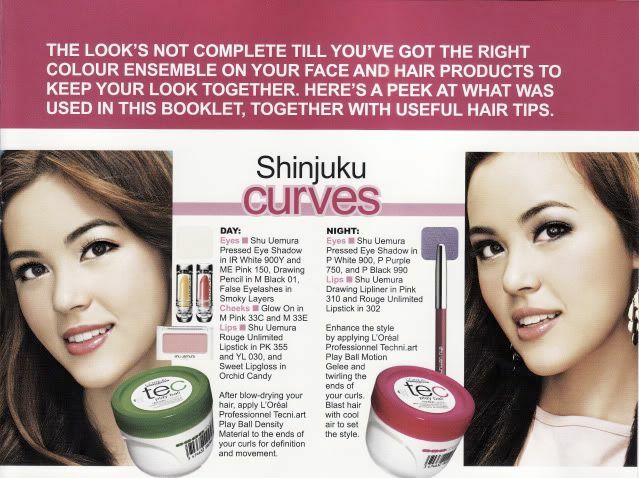 Think I look a bit weird in this photoshoot, especially the top right photo ("DAY" hairstyle), but the hair's pretty!!! My hair was dyed a lighter brown for this, but the highlights are extensions added that day itself. I only lasted about a week plus with this hair colour in SAJC before I was made to dye it back hahaha. So well... that was the last time I dyed my hair. I really quite like the big curls they did for me! Sadly it was not a perm; just curling. P.S. Anyway I just bought DIY hair dye to see if it really works. I mean of course hair dye works, but I want to see if its use/application is really that easy and whether the colour comes out well/evenly! Update another time. Maybe in my next photo I'll be a blonde! :o Okay just kidding. 11 comments on "Seventeen Magazine Cover + L'Oreal Editorial"
you have become more beautiful as you grew older. Wow, u look completely DIFFERENT in your Loreal ad. Hi sophie, can you do a blog entry on your rings and accessories? I am sure many would like to know what's inside your accessories box haha! Do consider! can u like blog more about your daily happenings? cause i think thats what your readers actually want to read. and if you are not doing so, because u think ur life is mundane. just think about how really mundane the lives of your non-good-looking readers actually are. i believe some of whom, don't even have friends to hang out with during long breaks in school. LOL i have the seventeen mag and i totally didn't realise it was you!! you looked more ang moh and slightly meatier last time! now you look different! (a lil ah lian but still pretty) haha. i found your blog after i read the 17 magazine article and coincidentally my schmate (ben) has ur link in his old blog.